“Miss Lilly on her weekly hike with Alex Theodorakis. Miss Lilly is totally blind but she loves to go on hikes. 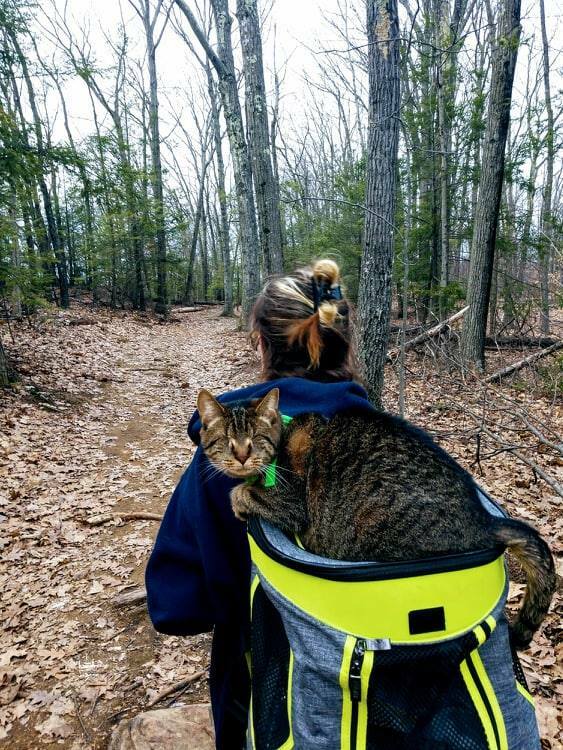 Here you can see she’s a bit tired and hitching a ride on Alex’s back pack.” – Facebook page of Westfield Homeless Cat Project Adoptions (WHCP). There is only one thing to say: ‘excellence’ and I mean in the standard of cat guardianship and in the fullness of life enjoyed by Lilly. I like to see this. I dream of taking my cat out on a leash to the river footpath near where I live. I want to walk him like a dog but I am dreaming. P.S. WHCP raised the money for Lilly’s eye surgery and more recently for a cat whose aural tumors were so persistent that he had to have both ears and part of the aural canals removed (thanks for this Laurie). White male blue eyed deaf cat (mutated breed) going blind? This entry was posted in blindness and tagged blind cat, hiking by Michael Broad. Bookmark the permalink.